A part of the Qur’an Seminar, a year-long initiative directed by Gabriel S. Reynolds from the University of Notre Dame, is to develop a project on cross-references of the Qur’an. This cross-references project will provide for nearly every verse in the Qur’an a selection of other verses which shed light upon, clarify, or explain the verse you are reading. As is known, the Qur’an in its printed edition has not yet been cross-referenced, in spite of the fact that al-mufassirūn (Qur’an commentators) realized quite early on the central importance of tafsīr al-Qur’an bi al-Qur’an (interpreting the Qur’an through the Qur’an itself). Even some modern Qur’an exegetes like the Iranian scholar Muḥammad Ḥusayn Ṭabaṭabā’ī (d. 1981) claim to follow this method. 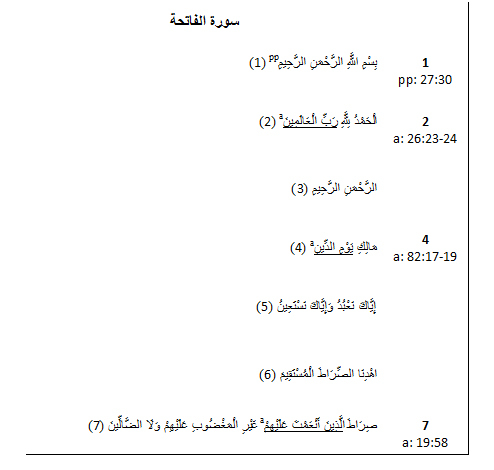 It must be pointed out, however, that the way Ṭabaṭabā’ī interprets the Qur’an in his al-Mīzān shows that his reliance on the internal evidence of the Qur’an is much less than his use of other sources as he offers not only an explication (bayān) of a given verse, but also an extensive discussion of various aspects such as historical, philosophical, and social aspects. It seems safe to say that in the long history of tafsīr, this tafsīr Qur’an bi al-Qur’an has not been dealt with as an important topic in its own right. There are only few tafsīrs which bear the title of tafsīr al-Qur’an bi al-Qur’an, two of which are Aḍwa’ al-bayan fi iḍaḥa al-Qur’an bi al-Qur’an by Muḥammad al-Shinqīṭī, and Al-Tafsīr al-Qur’anī li al-Qur’an by ‘Abd al-Karīm Khaṭīb. However, upon close reading, these two tafsīrs are not really tafsīr al-Qur’an bi al-Qur’an as the title seems to suppose. In 1930, the Egyptian scholar Muḥammad Abū Zaid wrote Al-Hidāya wa al-‘irfān fi tafsīr al-Qur’an bi al-Qur’an, which provides references to other passages which in the opinion of the author seems to shed some light on the verse under discussion. However, the cross-references he provided are very limited. In addition, because of his unorthodox interpretations of the Qur’an, his tafsīr was suppressed and he was declared as an atheist by Rashīd Riḍā. Perhaps, the most extensive treatment and pioneered work on tafsīr al-Qur’an bi al-Qur’an is that composed by Rudi Paret entitled Der Koran: Kommentar und Konkordanz. Paret’s work is certainly very rich, which includes – in addition to possible cross-references – interpretations of and alternate renderings for a given verse or passage. 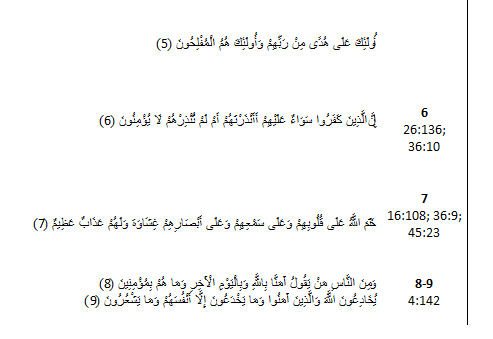 Furthermore, as the term “Konkordanz” may indicate, his Der Koran provides all identical or similar phraseology and usage in different places of the Qur’an, a model that will not be followed in this cross-references project. Instead, in this project the cross-references are based on connection between words, phrases, themes, concepts, events, and characters. One word may occur several times in the Qur’an, but the cross references will be made only where there is connection in meaning between two or more verses or passages. In doing this cross-references project, several models and methods used for the cross-references of the Bible are consulted, including The New Scofield Reference Bible, The New Treasury of Scripture Knowledge, The Bible Self-Explained, and The Thompson Chain-Reference Bible. As is well-known, the Bible cross-reference has been a long established tradition, while the Qur’an, at least in its printed edition, has not been cross-referenced. 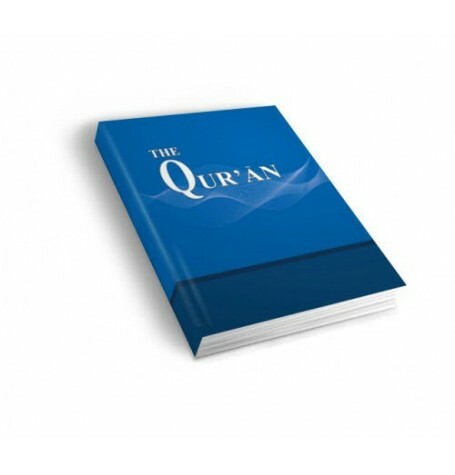 The need of such a work, therefore, is obvious to all readers of the Qur’an, because in the current available printed editions of the Qur’an there is nothing to indicate that certain passages shed light upon, clarify, or explain other passages. Are you currently working on a new publication or academic project on the Qur’an? Do you have innovative historical, scientific or artistic insights on the Qur’an that you would like to share? If so, you should consider writing a guest blog post for IQSAWEB. It’s easy. All you need to do is summarize your thoughts in about 500 words or less and send them to contact@iqsaweb.org. Audio-visual content is welcome. 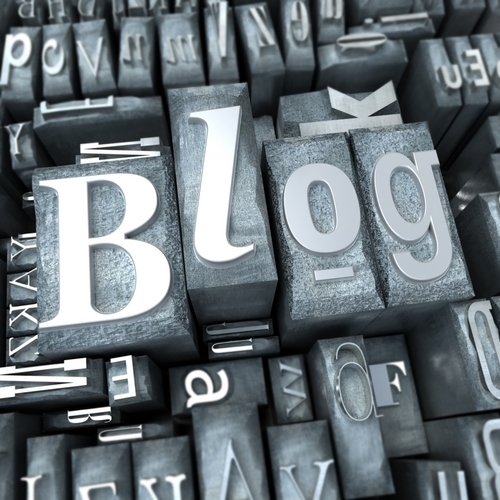 Guest blogging is also a great way to showcase your work and ideas to the world. Your post might also generate valuable discussion and debate. Feel free to browse the current blog posts on IQSAWEB, and do not forget to tell your colleagues! Since its press release in May 29, 2012 the International Qur’anic Studies Association (IQSA) has received the support of the academy as well as the public. In the months following, the media took much interest in IQSA, as well as SBL’s instrumental role in supporting this Qur’anic Studies initiative. Thanks to this widespread recognition, university professors, graduate students and academic institutions around the world continue to reach out to us and form valuable partnerships with IQSA. As co-directors of this initiative, we understand that forming meaningful relationships with sister organizations will be key to the success and growth of IQSA in the long term. We would like to take this opportunity to reach out to the members of SBL especially, and inform them about the vision of this initiative and their role within it. On November 18-19, 2012 IQSA will hold its first organizational meeting in Chicago. Its co-directors and steering committee will discuss several important matters, including governance, publishing, relationship building, fund raising and planning our first meeting in 2013, alongside SBL’s annual meeting. Our provisional plan is for our annual meetings to alternate between North America (alongside SBL) and a site in the Islamic world. We also plan on establishing a journal, a newsletter, and a monograph series that will publish in English as well as Arabic. We want IQSA to be ‘the place’ where Qur’anic Studies scholars from around the world, especially those in Western and Islamic countries, talk to one another, share cutting edge research, collaborate and publish their work. The collegial environment we will work towards will also make IQSA a center that fosters respect and mutual understanding through scholarship. One of the program units to be housed at IQSA conferences will explore the Qur’an’s dialogue with Biblical Literature; another will likely study the text in light of Semitic Linguistics. These areas of scholarship will prove to be a ‘bridge’ between members of IQSA and those of SBL. Scholars of Biblical Studies will have the opportunity to learn how Biblical traditions were adapted within the Qur’anic milieu. And scholars of Qur’anic Studies can learn how the text belongs to ‘the world of the Bible.’ You are invited to visit the initiative’s blog (http://iqsaweb.org), subscribe to IQSA’s e-mail list and keep up to date with our news and posts. We thank SBL for its support and look forward to working with its members.